WWW, July 2012 - A selection full of heavyweight DUB with a couple of vocal tracks, including some from the brand new free MP3 release "Italian Dub Community Showcase Chapter 4", freshly reviewed at mp3.dubroom.org, brand new Vibronics from the album "French Connection", Bush Chemists and more. 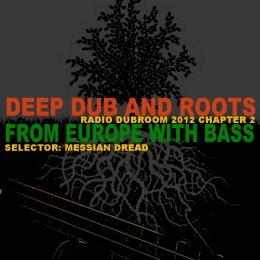 Encoded in High Quality MP3, here is Deep DUB and Roots from Europe, with Bass! In this extra-long selection, uploaded in ultra-high quality, we get a taste of some brand new releases, namely Vibronics' "French Connection" and the fourth instalment of the excellent Italian Dub Community Showcase series. Except for the first and the last track, this is a stricktly steppers selection just because it is Ammagideon Time or heading towards it, not just inna Europe but all over. We start of with two Dubplate mixes from Dougie Wardrop at his Conscious Sounds studio, featuring Tena Stelin and Hughie Izachaar on vocals. Followed by two heavyweight steppers and two vocals and Dubs with Culture Freeman in a heartical selection of uplifting, spiritual material from the well-known UK based collective. Vibronics recently released a very much reccomended album in which he works together with some of the top DUB producers in the country of France. These two, as well as two other tracks are included in this selection and they follow the Conscious Sounds segment. The second half of the non-stop mix is reserved for a selection out of the excellent Italian Dub Community Showcase series, of which Chapter Four was recently released and reviewed in the Dubroom. The free download is well worth it, as the Italian Dub Community show they're standing strong inna dis ya time. One hour and thirty-seven minutes of pure niceness to chant down Babylon and lift up consciousness! Bless!